A few years ago there was a flood of bags equipped with solar panels for easy charge on the go. But these bags suffered from low charging abilities as well as ugly design. Now the leading company in the field – voltaic bags – has released its new Spark Tablet case, the bag that does it all. 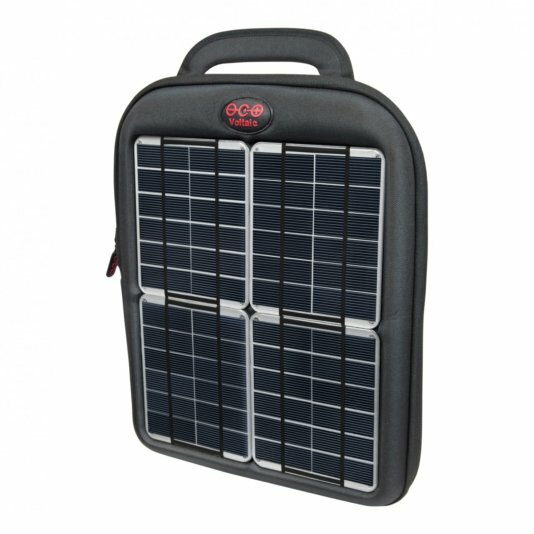 The Spark Tablet Case has 8 Watts of solar embedded into a streamlined case that creates the perfect iPad solar charger. It also charges most other tablets, phones and professional digital cameras. This bag is durable. The Panels are waterproof, lightweight and built to withstand abuse. The charge times are About 10 hours in direct sun, that will fully charge an iPad or iPad 2, longer for 3rd Generation iPad, but other tablets may take less time. The Universal Battery Pack stores power for use anytime and is specially designed to charge efficiently from solar. When not in the sun, the battery can be charged from normal or high-powered USB ports. It can also charge two devices at the same time. The Spark Tablet case is full of form and function from the inside out. Mesh pockets and lined sleeves keep all devices and tiny parts intact and in place. The case’s outer shell, made from recycled soda bottles, is super lightweight and incredibly durable, with a nice handle for grab and go. The case can also pop open, held up by the tablet, to create a neat, compact work space while charging. This beauty has a price to match: €279. But considering the fact that you never have to charge your tablet while paying for electricity, it sounds like a good deal.